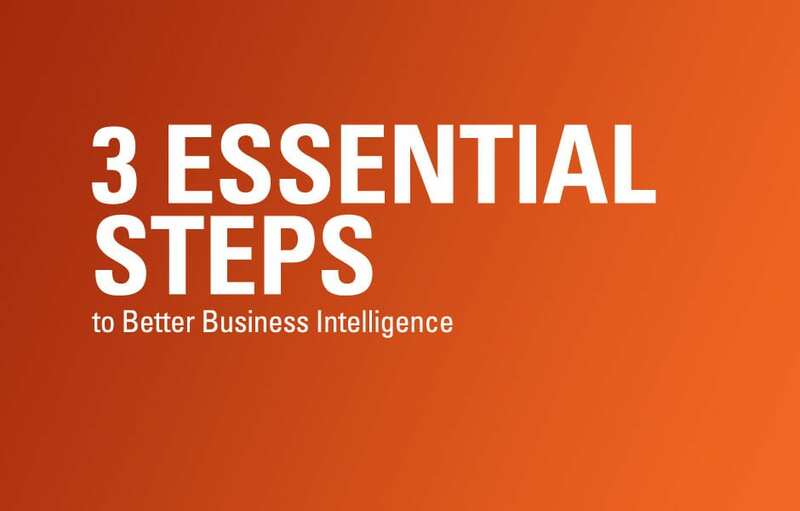 3 Essential Steps to Better Business Intelligence refers to the insights you discover when you turn all that data into something that your employees can use to make smart business decisions. Business leaders and managers at all levels are bombarded with data from accounting systems, CRM, ERP and other business applications. Much of this information comes in the form of reports, which can be difficult to read and understand, or charts, which often lack necessary background detail. Here are three essential steps to turning all those reams and megabytes of information into vital business insights - business intelligence. Knowledge may be power, but information overload can weaken even the best of us. The first step in combating this common problem is to determine what information is important and to whom. Every role has different information requirements. Salespeople require customer information. The finance team requires financial information. Manufacturing requires production data. There is some overlap. For example, manufacturing might require information on upcoming large orders to plan appropriately for production. However, you don't want to make production managers sift through all outstanding proposals searching for the one or two that might impact their production schedules. Narrowing down information dissemination to essential data points can help ensure that your teams keep their eye on what's important and avoid the "paralysis by analysis" that happens in many organizations. For the production manager just mentioned, sifting through a report of all open orders can be a time-wasting, error prone process. Alternatively, providing the manager with a dashboard of pending large orders for items with long production lead times would allow the manager to easily identify orders that need to be included in production forecasts. Real-time, role-specific key performance indicators (KPIs) provides business intelligence that help business leaders focus on the most vital information. Some business leaders sift through accounting reports or Excel worksheets every month analyzing data in order to distill the information down to the essential facts they need to do their job. Sound like fun? Probably not to those of you who want to get some real work done. Leaders and managers at all levels of the organization can be more productive when the information they need is presented in a readily understandable format. The effective organization will determine which Key Performance Indicators, or KPIs, are important for each role. Powerful productivity tools like Microsoft Excel can be used to analyze data from many sources and create charts and graphs that quickly give managers the business intelligence they need in order to perform effectively. PowerPivot for Excel 2010 allows you to create rich interactive BI tools in an environment that users already know. In order for these insights to be utilized, they need to be accessible. SharePoint Server can be used to create live interactive business intelligence portals. These portals can include dashboards set up by role and geography so that business leaders and managers have easy and quick access to the information that is most vital to them. SharePoint Server dashboards allow you to combine information from multiple sources in an easily understandable format. Information can be one of your organization's greatest assets. But, it can't contribute to your success unless it's deployed effectively. Too much and you risk drowning your business leaders in a sea of data. Too little and they don't have the business intelligence they need to do the job. By culling information down to the essential data points, presenting it in readily understandable ways, and making it easily accessible, you can provide business intelligence that improves productivity and helps your people make smart business decisions. Interested in learning more about business intelligence or how IT Solutions can help you get better insight into your company’s data? Contact IT Solutions to set up a no-obligation consultation and to learn more about our custom application development services. Companies today have too much information. What companies don't have enough of is intelligence - and no, we're not talking about your staff. Business intelligence refers to the insights you discover when you turn all that data into something that your employees can use to make smart business decisions. Business leaders and managers at all levels are bombarded with data from accounting systems, CRM, ERP and other business applications. Much of this information comes in the form of reports, which can be difficult to read and understand, or charts, which often lack necessary background detail. Here are three essential steps to turning all those reams and megabytes of information into vital business insights - business intelligence.